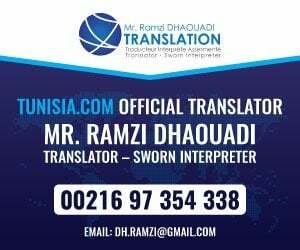 One of the stars attractions in Tunisia and certainly the most famous attraction in Monastir is the Ribat which is both an historical monument and somewhat of a movie-star having been in a number of movies the most famous being the Life of Brian and Jesus of Nazareth. No doubt high in the list criteria was to find something that looked both ancient and also could pass for being in use both of these the ribat meets with some aplomb.Harthama ben Ayan in 796 was the key architect and envisioned like the Ribat in Sousse to built the facility as part of the costal defenses that would protect the islamic empire form the heathens to the North. 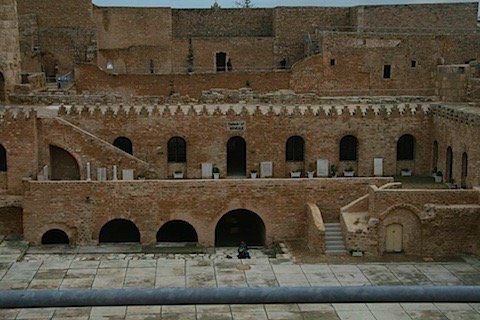 Unlike Sousse however the building was significantly added to over time and became much larger than the original structure. 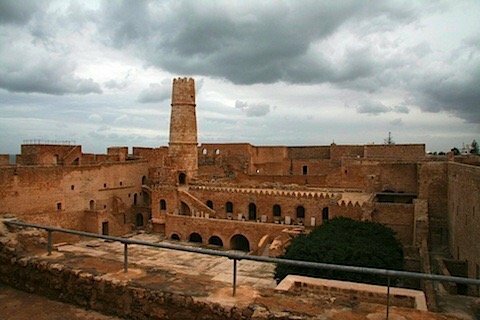 In the 11th century the Kasbah was built as where additions in each century after culminating in its extensive renovations in the 1960’s no doubt in keeping with its place as the main attraction of Monastir which was the then home town of the President. Each renovation added more space and the original structure of 1300 was extended to form a complex of over 2200m. Under the Aglabids the Ribat was religious centre, during the following years Monasir’s Ribat was a place of pilgrimage and an influencial Islamic educational center. The Ribat was called into action a few times in the 15th Century with part of it destroyed in 1550 by the spanish navy. At its most dangerous the Ribat was home to over 30 cannons and was a fortress of some renown. Around the Ribat you will find the old mosque of Monastir as well as a religious madrassa though these are now dwarfed by the 1960’s Habib Bourguiba mosque which was needed to cater for the towns increasing population.